With each release Thrice continues to develop and refine their sound, creating more textured, layered, and dynamic music. Scene Point Blank caught up with vocalist and guitarist Dustin Kensrue at the Cleveland stop of their current tour alongside Rise Against. Scene Point Blank: Today is the first day of the tour, are you excited to be out on the road in the again? Dustin Kensrue: That is yet to be seen. There is one song we haven't played yet and it's kind of a weirder song to translate live, "The Sky is Falling." We switched out the arrangement the last day of practice and haven't really played it yet. So we'll see how it turns out tonight. Scene Point Blank: Was there much downtime between tours? Dustin Kensrue: We were only off for three weeks, we were in Europe and Australia before this. It felt really short though, just kind of a whirlwind and then we're back out here. Scene Point Blank: In the past year the band has had quite a bit happen. You left Island Records and are now signed to Vagrant. What major differences have you noticed between the two, if any at all? Dustin Kensrue: There's just a little more accountableility with a smaller label. We see where everything is happening now. Nowhere is going to be perfect, but if the ball is being dropped, you're going to see it sooner. I don't think there is anything inherently bad about majors, it's just the bigness makes a lot of room for inefficiencies and redundancies. And you can't really afford redundancies. Scene Point Blank: A lot of major label bands have been leaving and signing with larger indies, New Found Glory and Thursday are the two most recent. Story of the Year also did it fairly recently. Do you see this as a new wave? Dustin Kensrue: I think it's more about the majors not knowing what to do with these bands anymore; they never really did. They thought there was money to be made, and in most cases there wasn't. The bands just weren't performing at the level for a major and were dropped. In general, everything is just complicated because the market been bad and worsening for a couple of years. Everyone is trying to downsize if and where they can. Scene Point Blank: Was there a plan in place when you chose to leave Island or did it all kind of happen after the fact? Dustin Kensrue: We just knew that we'd rather get out of there. If they didn't want us around, then we didn't want to be there. We'd kind of wanted to leave for a while; they just felt absent. The focus was more just on getting somewhere quick and where we would be comfortable. Scene Point Blank: Why Vagrant? Dustin Kensrue: We'd known Rich for a while and he'd wanted to sign us for a long time, even before we signed to Island. We knew they'd be interested and they were excited to get us onboard and get going. We didn't want to have some kind of bidding thing; we just wanted to find a good home for the time being. Scene Point Blank: For The Alchemy Index albums you focused on different elements. With that mind, was the songwriting process different from the previous albums as you had themetical sounds to associate the songs with? Dustin Kensrue: It was definitely from the bottom up, developed towards those ideas. At certain times, the initial demoing of a part would be like one or the other and we'd push it towards one way. Definitely in the writing at every level we were trying to capture each of the elements in different ways in different songs. That was always a large part of the writing process. Scene Point Blank: The concept behind The Alchemy Index releases was your idea that you brought to the band. Did it take much persuading with the rest of the band? Dustin Kensrue: No. It just went through a lot of phases. It's a pretty different and daunting idea, possibly a really bad one. You're not sure. Everyone thought about it a little while. After the initial period, we were all on board and went thorough some changes in how we were approaching it. Scene Point Blank: Thrice's sound has evolved over the years, with the diversity readily apparent on the styles of each album of the Alchemy Index. Have there been specific events throughout the span of Thrice that have contributed to this change? Dustin Kensrue: It's been pretty natural; there have been little points where things have happened. I feel like we're always trying to do something different, trying to do something we're excited about at the time. Scene Point Blank: Was there ever an effort to change your sound to distinguish yourselves from what other bands were doing that was similar? Dustin Kensrue: I don't think we're aware of certain effects like that until later. We just want to play music that we're really excited about playing. With artists, it's a really brushed process, in certain ways things end up differently than how we want them to be. And that really made us deliberate about making Vheissu exactly what we wanted it do be and making sure we had the time to accomplish that. And that's why there is just a seemingly large jump there. Had The Artist in the Ambulance been what we wanted it to be, it would have filled that gap a lot better. As far as the new records, I feel like its kind of transitioning pretty smoothly from Vheissu, at least in my mind. But it's this concept project, so it's all split up and therefore in certain ways its not natural the way that it got pushed so hard, but it is natural in the context of the project. Scene Point Blank: Has there been a particular band that has had a major influence on the band's development as songwriters? Dustin Kensrue: The only band that we'd really bring up in that context is Radiohead, more as a role model for a lot of the career decisions that they've made. It's been kind of an influence and an inspiration in that way. And they're collectively our favorite band, the band we all agree on the most. From there, we really branch out quite a bit. Scene Point Blank: Many fans have been taking the four Alchemy albums and putting together new mixes and posting them for others to hear. Have you guys checked any of these out? Dustin Kensrue: We talked bout doing some kind of contest at one point asking fans to rearrange them, but there is really no way to start evaluating it. The number of possibilities is a novel amount, really quite a lot. Scene Point Blank: Was this part of your intentions when creating the albums? Dustin Kensrue: I think that is kind of a natural outlook and I think a lot of the songs could go together even though they fit on their respective CD's. Scene Point Blank: In between 2005's Vheissu and the two Alchemy Index albums, Dustin released a solo album, which was also of a different direction. When listening to the two Alchemy albums, you can hear a lot more of that sound in the music on certain songs. Were you guys more open minded to venture outside what was previously "Thrice"? Dustin Kensrue: You're referring more to the "earth" stuff. I don't think it has anything to do with the solo record. I think it happened for various reasons? we were making the "earth" record and it naturally lent itself to similar influences of the solo record. And also working with Teppei as an engineer, I'm a lot more comfortable singing how I feel like I want to sing. I think Brian was a really good producer; I just don't feel like he pushed me vocally or gave me much freedom. Steve Osborn was better with that. But you're in this sterile environment in the studio with this time schedule. I got used to working with Teppei on my solo record and it was very easy. We get along really well and kind of think similarly about a lot of things. I feel like that played into me being more expressive vocally. I feel like that went over on all the records, I think the earthy influences were a coincidence, drawing from the same places as the solo record. One of the songs was going to be on my solo record and ended up being pulling over. Scene Point Blank: Which song was that? Dustin Kensrue: "Moving Mountains." It's a little different now. We took a riff that Ed had and rewrote and added. Scene Point Blank: At this point in your career, you have quite the back catalog of songs to choose from. Most bands tend to avoid inserting older songs into their setlists, yet you seem to embrace it. What goes into the decisions of choosing songs to play? Dustin Kensrue: We try to. It's hard. It gets to where you're only playing two songs from a record. Like on this tour, we only have an eleven song set. It gets hard to even make anyone happy. If you're trying to please everyone, you can't do it. We try to play stuff that is newer, because it is stuff that we're excited about and proud of at the time. I think it is good to hear it in a live context and we try to play old stuff as well. It's hard to get a handle on what works well versus what you feel like people like. It's really a complicated thing to do. It gets worse and worse with more and more song. We tried to switch up the base of songs we're playing from on this tour, even for the headline shows, to where we're playing quite a few different ones from what we played in the past year or two. Scene Point Blank: To date you've toured with a lot of bands - Brand New, Further Seems Forever, Coheed & Cambria, Dashboard Confessional, and Pelican. What band have you been most excited to tour with? Dustin Kensrue: We were really excited about that Brand New tour. We were friends with them already and we ended up meeting the Mewithoutyou guys and became friends with them. That was one of the most fun tours we'd ever been on. It was a super long tour and it would have been awful if it weren't so great with them. We're really excited to be with Gaslight Anthem on this tour. I just started listening to that record a lot and I dig it. We love the Hot Water Music guys; we toured the states with them twice. Scene Point Blank: Is there a band you've yet to tour with that you'd like to hit the road with? Dustin Kensrue: That's always a weird question for me, like "Make your dream show that you'd be on." I wouldn't be on my dream show, I'd be watching. This tour is going to be a really fun though, we've know the Alkaline Trio guys for a while, and Rise Against guys a little bit. It's a good group of people and that makes all the difference. Scene Point Blank: Earlier this Summer you recorded a show for a live DVD. What's the status on that release? Dustin Kensrue: It should be announced in the next week, with details for when it is coming out this year. The vinyl is going to be coming out. I'm doing a Christmas record that should be out before Christmas. It will be two originals and some covers. Scene Point Blank: A few years back you covered Minor Threat's "Seeing Red" and "Screaming at a Wall" for a compilation. I was just curious why you chose that specific band and that song? Dustin Kensrue: They wanted us to do a Westcoast band and we kind of fought to do that one. It seemed like they'd be a really fun band to cover; their songs are pretty short so we just put two together. I can't remember, we just really wanted to do them, and certain other bands that we would have liked to do were already taken so it just seemed to make sense. Scene Point Blank: Digital downloading still is a major issue within the music world. What's been your reaction to craze of digital download - both in illegal form and the now-popularized "Radiohead-esque" campaign? Dustin Kensrue: I guess it obviously makes it harder to exist to be a band. Any band that tells you otherwise is lying. It's not just making money and records. It makes everyone in the industry scared to take chances and the labels to sign newer bands that they're not sure are going to sell. It affects things on a pretty wide scale. I personally like buying vinyl, but I also buy things on iTunes. It's so easy and it's cheap and affordable. You pay seventeen dollars in a store; you only pay ten dollars on iTunes. I'm really into the idea of doing vinyl with digital download. It's the best of both worlds. You get a product that sounds great when you're at home, but when you're not, you have something with you. I would like to do that in the future. I like the idea of doing single record deals because it is honest. I don't feel cornered and if everyone is happy with the situation you can keep going on. I think we'll do that again. Scene Point Blank: With each album, portions of the sales are contributed to a non-profit organization or charity. How important is assistance like this to you? Dustin Kensrue: I feel weird when a lot of attention gets put on us for that. We're no doing it for the attention, but we're doing it to do raise awareness, so it's kind of counterintuitive. I just don't think we're doing anything crazy; we're trying to do something to help and do it our own way. It's not a template to lay out, its just, this is one way to do something consistently. Scene Point Blank: Outside of these donations, are you involved in any other charities work? Dustin Kensrue: We're never home enough to do something consistent, which kind of bugs me because I would like to do something like that. I think we all, for that much, give to various organizations that we feel are doing some good work. Scene Point Blank: As far as politics and the upcoming campaign? 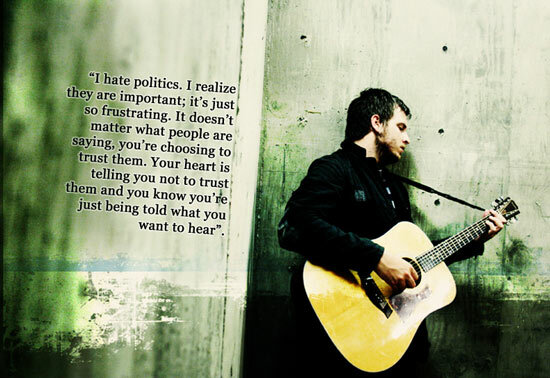 Dustin Kensrue: I hate politics. I realize they are important; it's just so frustrating. It doesn't matter what people are saying, you're choosing to trust them. Your heart is telling you not to trust them and you know you're just being told what you want to hear. It doesn't mean you shouldn't get involved. I guess my point is that I rarely feel strong enough on political issues, not social issues, to advise others on what I think they should do. I think that's a very personal decision. I don't want to be responsible for influencing others. My biggest problem is I don't fall down party lines, half the issues I sit on one side, half the issues I sit on the other side. Right now, there are benefits to both sides. Scene Point Blank: Back to lighter subject matter, what bands/ albums have you been listening to most this year? Dustin Kensrue: Been digging on the new Gaslight Anthem album. I've been listening to a bunch of Christmas music because I'm making a record. In my car, I've had my iPod on random, which is really fun; it's like having a really good radio station. I had three Strike Anywhere songs come up and I was super psyched. What else? Nada Surf's Let Go. It's a really mellow and good chill record. I was listening to a lot of Whiskeytown recently. Scene Point Blank: Following the tour, what kind of plans does the band have? Dustin Kensrue: Start trying to write and record pretty quick, possibly do some kind of spotted touring next year. 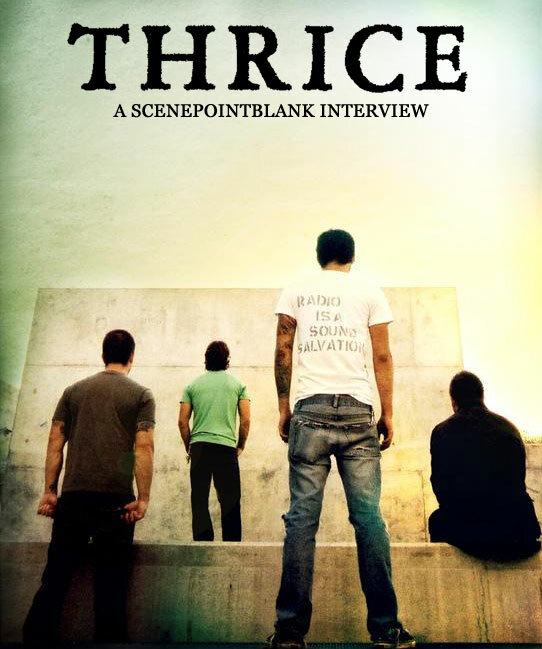 Scene Point Blank: Final question; it's been noted in other interviews that the band is more than just a mode for musical expression. So, besides making music, what specifically do you hope to accomplish with the band? Dustin Kensrue: For us, the band exists because we enjoy making music together and I think we continue to challenge ourselves and push ourselves. If that stops, I think, maybe there wouldn't be a band? I think that is kind of the reason why we're always moving, I don't think we'd be really happy trying to rehash something as it goes against the grain that we are. Scene Point Blank: What does writing and performing music do for you? Dustin Kensrue: I have to do, but I don't really grasp why. There are moments where you feel like you understand why more than others. Certain times it's like trying to get something, an ordering of things, especially lyrically. If I end up getting stuff just right, it feels really good to accomplish that. Not really for anything else, just that it was right. I don't spend a lot of time internalizing things. And there's not like a high that I'm after, it's just a steady push. It feels like what I'm supposed to do. I do it better than I do anything else. I think about what I would do if I wasn't doing this. There are not many things that I would feel as fulfilled doing. Posted July 26, 2017, 8:24 a.m.
Posted Dec. 30, 2014, 10:02 a.m.
On Jan. 20 Major/Minor (2011), from Thrice, will be re-pressed on vinyl by Staple Records/Workhorse Music Group. The currently out-of-print record will be limited to 1500 copies. Posted Sept. 11, 2014, 2:24 a.m.